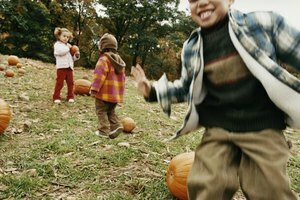 For parents who are cautious about celebrating Halloween or who have concerns about the safety of trick-or-treating, Christian harvest parties, also known as fall festivals, provide a reassuring alternative. Typically planned for the last week in October to coincide with the celebration of Halloween, these autumnal festivals provide booths, hayrides, candy and entertainment for children, young adults and their families. They also offer the chance to participate in competitive games, both indoor and outdoor, with prizes. Young children would best enjoy the pumpkin roll. Adults set up lines of tape along a floor from one end of a room to the other. Children are given a small pumpkin and when the leader gives the signal, roll the pumpkin along the tape to the end of the line. The object of the game is to reach the end of the line before your opponents. In a similar game for children and young adults, the pumpkin ring toss, several pumpkins with long stems are placed in a wide circle. Players stand behind a line and attempt to throw rings around the stems of the pumpkins. Those with success on the more challenging pumpkins are awarded more points. Players are awarded different prizes depending on the number of points they score. In the “Harvest Dash” relay game, divide a group up into pairs and give each player a ladle. Place two large containers full of birdseed at the other end of the room and a pair of smaller containers at the starting line. One player from each team must run to the container, scoop up as much seed as possible into the ladle and race back to the small container. The next player then takes the ladle and continues the relay. The winning team is the team that fills up its container the fastest. In the Bible relay race, split players into teams and give each team a list of verses. The first person from each team must run to the opposite end of the room to a table covered with Bibles, and find the first verse on the list. This player then runs back across the room and tries to write down the verse without forgetting it. Once this is done, the second player runs forward. Points are awarded based on speed and the accuracy of the written verses. In the David and Goliath ball game, children and young adults take turns slinging “stones” at a picture of Goliath made out of paper or cardboard set against a wall. Give each player a sling and a stone made out of a beanbag. The object of the game is to hit the giant’s head. Prizes are awarded to those who come closest. In “Goliath’s Hungry,” one staff member plays Goliath. Divide kids into two teams with Goliath in the middle. Every time Goliath shouts, “I’m hungry!” the two teams switch sides, with Goliath tapping as many players as he can. Those who are tapped join him in the middle, attempting to tag others. The game ends when everyone has been conquered. This game for children and younger teens works best with a large group and is designed to teach the fruits of the Spirit. An adult leader arranges chairs in a circle, placing one less chair than the number of kids present. At the beginning of the game, every child is seated except for one who stands in the middle. Each player thinks of a fruit of the Spirit -- love, joy, peace, patience, kindness, gentleness, goodness, gentleness or self-control. The person in the middle calls out one of these, and those who were thinking of that fruit get up and scramble to find another chair. The player left without a seat takes the place in the middle, and the game continues until the leader ends it. If at any point the player in the middle yells, “Fruit basket upset!” then everyone gets up and scrambles to find a new seat. Reason to Party: Fall Harvest Party!